My father believed there was a fundamental difference between men and women. I believed that men and women were fundamentally the same. We argued about this from time to time. One thing that hypersystemizers like myself do is see more similarities than differences. Everything is related to something else. Our difficulty is not in seeing the relations but in seeing the subtle differences. So we must work hard to find these differences, because it is those differences that allow us to accurately categorize the world in our complex inner structure. In empirical science, something must be falsifiable to be meaningful. That doesn't mean that if it cannot be falsified it is wrong, that just means that it is not meaningful to science. In electronics, there is a device called a comparator↗. But a less sophisticated device is a simple NOR gate. These devices compare two inputs and essentially decide if those inputs are "same" or "different". From simple NOR gates, an entire computer can be constructed. When I began working on my LandmarkFilm, I did not set out to find TheGreatFractal, I set out to create a film. But I kept coming across the same mathematical patterns. I learned right away that duality is threaded throughout nature and incorporated it into the work. Within this duality, like the natural bounds of the universe, you create a pattern, like the Freytag structure↗, and I used every expressive element I could to create these patterns. I began inserting actual geometric patterns, and eventually symbols. A geometric pattern is a shape related to mathematics, but symbols were those same geometries related to our lives. The very fact that you can even use geometry to express our lives says something profound about what our lives really are, that perhaps we are only just higher level expressions of this geometry. When my father built a discotheque in the 1970's, he didn't paint the words "Men" and "Women" on the bathroom doors, he painted the Mars and Venus symbols of the arrow and the cross. By my early thirties, I began to see the immense power of symbols, and found that they are almost too powerful for direct inclusion in storytelling. They are the refined extractions, like extracting sugar from plums and then trying to recombine it with normal plums to create a candy. The candy can become a distraction. In the early 2000's I bought an introductory remote viewing↗ videotape of Ed Dames, and in the tape, he discussed ideograms, compressed expressions of our subconscious in the form of written squiqqles, marks, and scratches, vaguely symbolic, but mostly noise. Ideograms may have formed the shapes of the written alphabet of our language. If you look at letters, especially the evolution of alphabets from ancient languages to present, you can actually see certain patterns come into coherence over the centuries. Letters in an alphabet form phonemes, the sounds that compose words and are usually not words themselves. In other languages, "letters" are actually logograms and represent entire words. So in a phonologic writing systems like English, Arabic, or Hebrew there are a relatively small number of letters and we need to combine them to get meaning, but in logographic writing systems like written Chinese or Kanji, there are many thousands more. Because my native writing system is an phonologic alphabet, the sounds of the words and images can float around in my mind, I can hear my thoughts expressed in the same words I use to communicate. I can manipulate them with fair precision. This gives me the ability for thought and introspection. But when I come across symbols such as glyphs that are not part of my alphabet but also have meaning, my conscious mind doesn't have such control over them. They are full of immense energy. Symbols are like the alphabet of a higher-order being, the collective of Mankind. Yes, we do have access to use them in our works, but they are like playing with fire. We don't know exactly what we are doing when we use them; they touch so many people, they relate to so many ideas in different ways. If symbols are expressed inadvertently, through our subconscious, which happens all the time to people, then a higher-order being is working through us and may be connecting to the subconscious of others, but if we consciously decide to "insert" them, then we don't know what we are actually saying to other people. In college I wrote a paper stating that I was an "anti-symbolist" and that I believed the purpose of communication was to express our thoughts exactly and not allow other meanings to be perceived. I considered other meanings to be errors in the signal. I believed that many famous abstract artists created art, which I said, whose "symbolism was without bounds, like a comic book superhero with unlimited power, and as everyone knows, you can't have a story unless your superhero has a weak-spot. The kryptonite makes the Superman." It wasn't until I started making my film that I realized what was happening. They weren't speaking in one voice, they were "channeling" the voices of collective humanity through them. This wasn't communication as I had understood it, it was mostly translation, and the artist was more of an creative interpreter than a creator. So I have worked to get better at wielding this fire, but it remains fire. To have complete mastery of it requires absolute context, that you understand every viewpoint of every field of human study in every culture. At first, I made the mistake of consciously inserting the symbols, and my subconscious said "No!" and I tweaked it, and my subconscious said "No!" and then I realized that this fire was outside of the power of my superconscious mind, no matter how cleverly I crafted it so I had to disengage, sit back and allow the subconscious to grab the controls. Me and my subconscious...ehm... we have this agreement now--we are best buds. If you don't know what I mean or you think I'm crazy, I just have to say one thing: develop a relationship with your subconscious as if it were a separate being inhabiting your body with you, a being you dragged along on all of your stupid adventures. Just remember that this being is Godlike, it is watching, it is judging, and it sometimes slaps your hand and takes the controls from you. But the weird part is, that it is simply you. In filmmaking you have great opportunity to use visual symbols and mechanisms. Good films are multi-layered stories within stories, with expressiveness on many levels, and much of this is only possible through the subconscious. But letters themselves, although simple shapes, are actually symbols, although perhaps not as powerful as the words they form. And the typeface can encode more meaning into the letters. Think about it, anything we write, however messy, must not just be a form of noise, it HAS to contain information, just perhaps not information we can comprehend. While writing my script, I did most of my work in pencil on dull yellow paper before transferring it to a computer. I needed more control over the letter shapes that a computer font didn't allow. The dull yellow paper was calm and allowed my subconscious to manipulate these letter symbols into their final form (words). The alphabetical letters that we work with everyday to create our language are like Mushi↗, they are tiny fragments of life, a life composed of information. They are our building blocks. Our thoughts are their collective voices. We are their Egregore. And they are tiny egregores made up of ink and graphite. Perhaps the fictional Mushi were inspired by Japanese Kanji, as some of the characters resemble pictograms of the object itself. If you watch documentaries of people with brain damage that have "religious" experiences, seeing the entire world as sacred and alive, this matches closely with the DMT and near-death experiences of other people. It seems, for these people, that their filter has either been damaged or suppressed, and they are receiving raw information, like that refined sugar. I am very much a product of Western education. Even though my father was Persian, I did not grow up within his culture, but I did have the ability and opportunity to compare and contrast. But as an adult now, I also have the ability to compare and contrast human history, including my own, through Time. In the West, we have a long history of extracting and atomizing materials from nature and then recombining them in unnatural ways. In the East, they have a long history of keeping in harmony with nature. This is, of course, a broad generalization, and there is much crossover, but it shows that our giant civilizations that have formed over thousands of years still hold different points of view on the same things. Neither is right or wrong, fundamentally, as the objects under our gaze are complex and multi-faceted. But, like how any computer program can be created on any language that is TuringComplete, regardless of its syntax, the East and West have been metaphorically "Turing Complete" since their inception. Being obtuse to nature and the natural order of so many things around me, I have developed other methods of acquiring truth, and my methods also point to the same thing, that the entire world, even the inanimate world, is alive and sacred. Anything that forms in the vast randomness of the Universe is alive with energy. Your life is profound. Your work is profound. Your scribbly doodles and your mistakes are profound. When I switched from empiricism to rationalism after Mr. Gleick showed me fractals, I knew for certain that we had a priori knowledge↗. But it doesn't come in the form we expect. It comes in the form of our manifestation into this world. We are information that was formed from the information of our ancestors, our genetic code. But this code is not just the simple blueprint for an anatomical machine, it is a blueprint of even greater knowledge of mankind that we cannot yet comprehend. If you reverse-engineered alien technology, for example, you would not only find its purpose encoded within it, you would understand something about the foreign culture from which it came, through archaeology. So if you consider that each human is a component of a greater organism, a holistic approach, studying our genetic code in this way is an archaeology of a Greater Being, a type of evolutionary cosmology, like archaeogenetics applied at a higher level. In object-oriented programming, the object cannot see this information directly, it is just the result of it. This is known as encapsulation. Similarly, within yourself, you will not know innately that you have a priori knowledge, this is hidden from you. But because our environment is rich in multi-directional communication (peer-to-peer, parent-to-child, computer modeling, and the Internet) you can compare your relative position to the rest of the world and know that the knowledge has always been there inside you. Consider the fact that you have never seen your own face. Besides touch, you do not directly know that your face exists. You have only seen indirect evidence (reflection in mirrors, photographs, video) and you know that other individuals have faces, but you have never, ever, directly seen your own face. And if you wanted to see the back of your head, you need at least two mirrors, not just one. At some point we must make the leap from correlation to causality and jump the gap from the idealized pattern in our mind to the particulate world, the one we think is real. Science will never jump that gap. It will only get you close. The causality of the universe is a pattern, a pattern that we expect will continue, but there is no proof that it will do so. For me, I can see that the world is fractal, that mankind is just part of this fractal, and therefore the rules of fractals will also apply to me. Science can not prove that the world is a fractal, but it cannot disprove it either. For if we are inside the fractal, we must also be encapsulated, being generated by a higher code we do not have direct access to. But we do not know if Mankind has rich, multi-directional communication with its higher being. We cannot initiate a conversation with our higher-order parents to see our own pattern, as our position prohibits this, and even so, we are still uncertain who they are. The mirrors, photographs, and videos that we use to show our own face are machines built by Mankind, a higher-order organism. But Mankind has not yet been provided with any machines of self-reflection from its higher-order organism, at least that we know of. If such a transaction were to occur, we may not find out unless Mankind decides to pass this information down to us in a way we can understand. 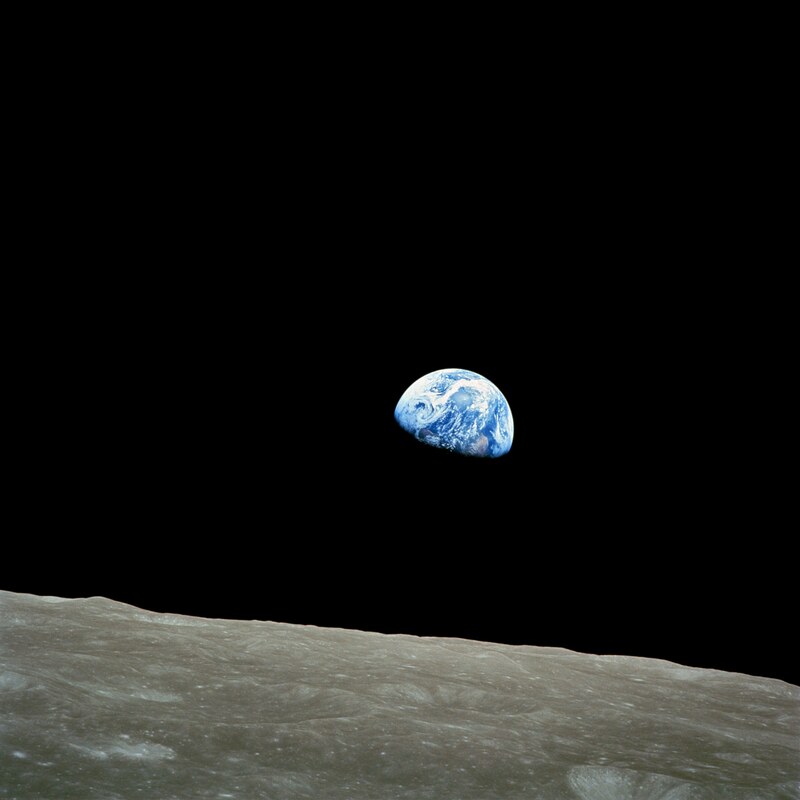 However, during Apollo 8, the famous photograph of the earth rising on the moon was taken by astronaut Bill Anders on Christmas Eve, 1968, where Mankind turned the camera back at itself from another celestial body, an extremely sophisticated and expensive selfie. If you look at that famous photograph, you will see two objects, the circle (the earth) and the line (the horizon of the moon). Throughout my film research, I kept coming across these forms in duality. This was interesting to me, as I had usually equated duality to BinaryOpposition, such as a binary 1 to 0, high/low, light/dark, etc. But a circle and a line were geometric primitives, too abstract to polarize. I had studied such primitives in college and never noticed any such duality. But then I started to think about polar coordinates vs. Cartesian coordinates, vector displays and glyphs vs. raster displays and bitmaps, how they were two different ways of expressing the same thing. Perhaps during those late nights at the data center in Columbia where I would watch the line printers shoot out tractor-fed paper into the air at amazing speeds, a page every few seconds, and high-speed plotters drawing intricate curves, my brain had begun to piece together a hidden duality that was always there. Emerson had discovered it. And the Gateway Arch itself was more like a glyph, a symbol. The circle and the line are geometric dualities, the 0 and the 1 of a higher order. At at an even higher order, they manifest into the female and the male forms. Why didn't I notice this before? I knew about Freudian symbolism, for example, but this was basic geometry. I guess I never considered them dualities before because the line is one-dimensional and the circle is two-dimensional, so they didn't seem to share the same context at all, mathematically, so you couldn't just invert them, for example. The algebraic equations of a line are very different from the equations of a circle. A circle isn't even a mathematical function. But they are really just different forms of the same thing. A line is 1-dimensional, and has 1 degree of freedom. A circle is 2-dimensional, yet it only has 1 degree of freedom. A satellite orbiting the earth, for example, is moving in a straight line, but the space in which it is moving is warped by the gravity of the earth, a path called a "geodesic". The difference was not the object itself, but the space it was in. A line goes back and forth to infinity, and it has no beginning and no end. A circle goes back and forth to infinity, and it has no beginning and no end (since it loops around). Rotational motion can be mechanically converted to linear motion though a crankshaft. It can be electrically converted into linear electron motion through a generator. In fact the very shape of the Arabic numerals that we use to denote the digital duality (binary 0 and 1) pictographically resemble the circle and the line. Mankind had already evolved these symbols into our numerals at the lowest level. This shows the immense power of the human collective as it encodes knowledge into the very shapes we use to communicate. This all might seem obvious to you, but to me, I had to see the mechanism first. Living in Missouri with its jungle-like summers, I spent a lot of time mowing lawns to make money when I was young. I worked for my neighbor's lawn mowing business for several years and I also created my own lawn mowing business in my early twenties, since I could not break into the computing field until years later. So I was mowing lawns in the day, and working on electronics and programming at night. It was like I was living both of the main roles in the movie The Lawnmower Man↗ which was oddly released during that same time. Through much of high school, I mowed 9 lawns on some days with a small push mower, some of the lawns commercial. And many customers had certain "patterns" they wanted mowed into their lawns, as the wheels of the lawnmower left indented tracks behind. Some liked their lawns mowed in long strips, back and forth, and others liked boxed-in spirals. Some wanted triangles in some areas, some wanted the entire boundary or outline of the yard mowed first, and then successively mowed to fill in the interior. It was straight lines and curves. In fact, I did so much of this, that I became strangely Zen-like, as mowing was an isolated, meditative, reflective experience, not unlike distance running. When I got to college, I actually wrote and performed a speech related to this for the debate/forensics team in 1993, which I used in several intercollegiate tournaments. It was of category "After Dinner Speech", and I decided to create a humorous, but insightful, story of grass becoming an intelligent being, a collective; a representation of our mind. Few people found my humor funny, and I always came in dead last. Most judges thought it was strange, as they lacked my life-long context. To me, it was all profound. I made references to mathematics that most of them didn't understand (like coefficients, oscillations, and the Fibonacci sequence, a close relative to the famous Phi which is found throughout nature, relating to rabbit populations). I constructed multi-layered commentary, including a recursive self-commentary as I did in my other speeches, but the layers escaped them. There is a paragraph where the speech reflected back on the absurdity of the rules of the forensics competition itself. Like the fractal, there was an outer bound, but I could seemingly break those bounds by spiraling inward into additional complexity. And also during that time, I was running middle-distance track, counter-clockwise loop after loop. A 400m track is an oval with "straightaways" on the sides, and half-circles on the ends. There it is again, the lines and the circles. I had intimate, tangible knowledge of the line and the circle, I just didn't realize it for many years. When you overlay the circle and the line on the Venus and Mars gender symbols, respectively, you can see the similarity. The Venus symbol is a cross (2 dimensional lines, like a circle), but the Mars symbol is an arrow, single dimensional. Just as a TuringComplete computer language can create any imaginable artificial world from just 0 and 1, the circle and the line are higher level abstractions of those same building blocks in the real world. A circle is a cycle, and when combined with the line, fractal growth patterns emerge. Instead of the information going round and round, staying withing its boundaries, it bursts into infinite complexity. English and its alphabet seem to be a union of male and female forms. Those little scratches, those little curves, are magical. My father was right. There is something fundamentally different between male and female, for without those differences, we would have no growth. But they are just different sides of the same thing, depending on which side of the mirror you are on. Have you ever heard that album Haunted by Poe? She found audio tapes recorded by her father to her after his death and put it into her art. I went to one of her concerts and when my friend had gone to the bathroom, she jumped off stage during the song Haunted, ran right up to me, put the microphone up to my face and had me sing part of her song (the "ba da pa pa" part). This is an interesting story, as there is nobody I personally know that witnessed this event, so I have to recite the story with no proof except that of my own memory. 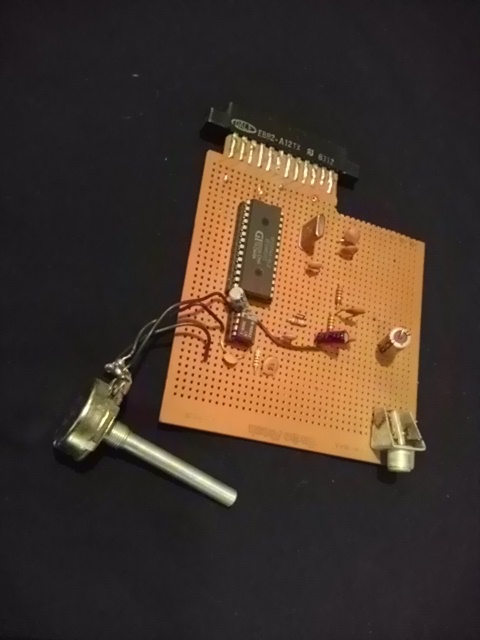 If you think about it, those were "phonemes", the basic components of a phonologic language, like I mentioned earlier, something I used when I programmed this speech chip as a teenager. But look at the sounds she chose, they all contain a secondary a, but they start with either b, d, or p. The b, d, and p are vertically and horizontally symmetric. She could have said "ba za pa pa" or "ta da pa pa", but she chose "ba da pa pa", keeping the glyph symmetry. I told you hypersystemizers see similarities in things. After I saw the glyph symmetry, I focused on why she chose those sounds. All are basic sounds that mean "father" in various languages if doubled (papa, dada, baba). Even those tiny utterances, those tiny word fragments, have a large voice. The universe is alive and connected. It impresses me every day, whether it is scientifically meaningful or mathematically beautiful, which don't always coincide. I never saw my father kill a living thing, even an insect. If I tore leaves off of plants, he reminded me that I was hurting the plant, that it was a living thing, and that it was not right to destroy it and that I should let it be. He didn't grow up with fields of grass to mow, he had an intricate walled garden. He used to doodle while he talked on the telephone, an old rotary Bell telephone. 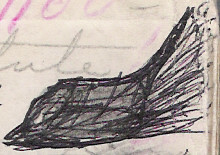 He talked in Farsi, so I could never understand his conversations, but I sometimes watched him doodle. His alphabet was Arabic, full of curves and dots. At some points he had doodled all over the table without realizing it. 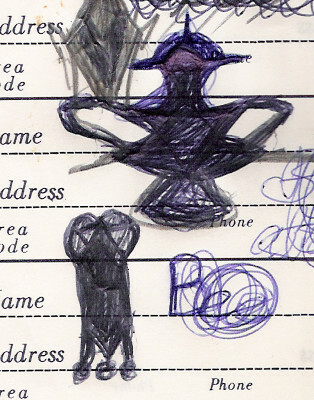 Years ago, when I was a child, I saved a fragment of our old telephone directory, containing his doodles. I knew that there was something encoded in those doodles, like how Poe's father left those audio recordings to her from the past. 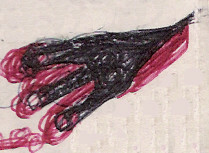 Our handwriting and scribbles are tiny forms of life, energy that exists in the informational universe. Sometimes it is not right to destroy them, but to let them be.